Perfect Peas...You Can Grow That! We're in serious countdown mode for spring...only 15 days, 5 hours, as of my most recent check. Hooray! But, my friends, you know what that means: it's time to get busy. I know some of you are still buried in snow. I'm sorry. Here, in our zone 7b gardens, we're cleaning up beds, adding fresh compost, and—of course—planting peas. Peas are one of the easiest, earliest, and most satisfying spring crops to grow. With two children who fuss about every vegetable served, I'm in heaven when I find something they'll eat without too much drama. Peas get a bad rap. Too many generations grew up with the smelly, unfortunate canned peas that they were forced to choke down at the dinner table. Fresh-from-the-garden peas, however, share no resemblance to their canned cousins. These sweet, crunchy, garden treats often don't make it to our dinner table. Instead, they're eaten like candy, munched on while gardening, a handful plucked while playing with pups. Of course, I couldn't decide on just one variety. Instead, I selected six pea varieties for the gardens this spring. Golden Sweet, Blauwschokkers (Blue Podded Shelling), Amish Snap, Snowbird, English Sugar Snap, and Tom Thumb are all tucked into the cool soil. But how do you decide which varieties to select? And how can you ensure good growth and harvest? No worries. Peas are simple. I promise: You Can Grow That! First, decide which type of pea you and your family enjoy the most. Do you love stir fry? You'll want to grow snow peas in your garden. Do you want to harvest and save peas for winter dishes? You'll want to add shelling peas. If you enjoy eating sweet, crunchy side dishes, sugar snap peas provide a delicious, nutritious addition to dinner. Or, like me, you can grow a bit of each variety to cover all of your bases. 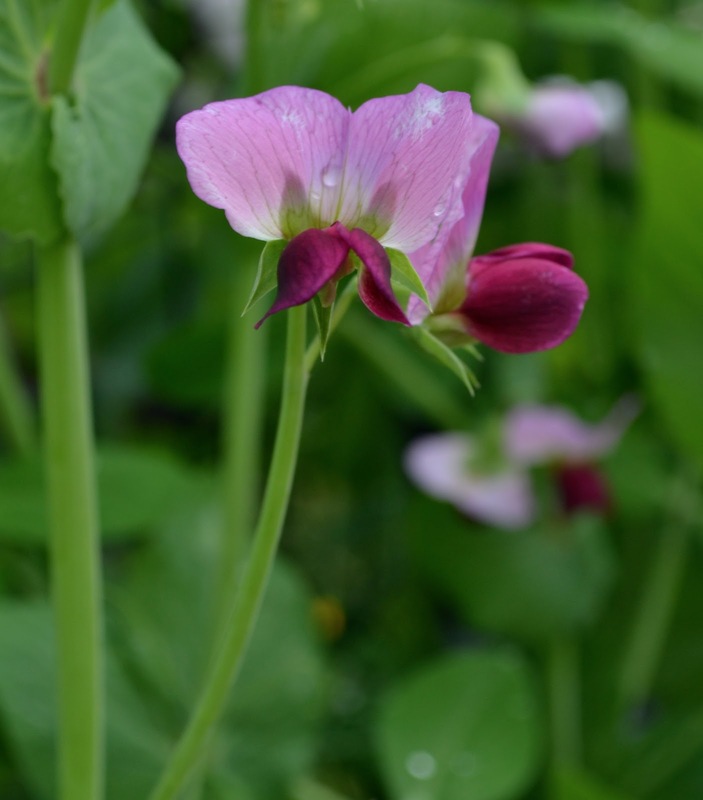 When selecting seed, you're looking for peas that have edible- or non-edible pods. Non-edible pods are the traditional shelling peas, which are quite labor-intensive. You won't win over the kids' taste buds if you enlist them to shell peas for hours. 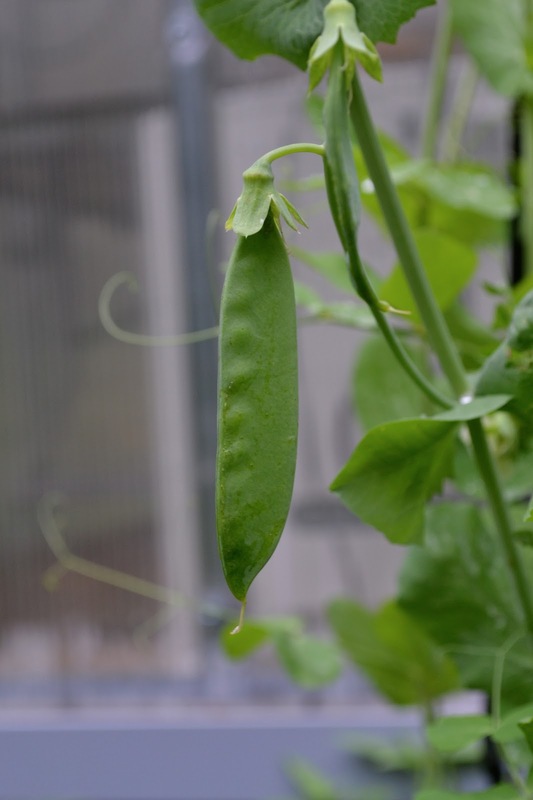 Edible-podded peas include snap and snow peas. Snap peas are eaten similarly to snap beans—they are, after all, related. Simply remove the ends and pull off the string, et voilá! A tasty treat, ready for eating. You can also serve them cooked, but remember—less is more. There's nothing appetizing about mushy peas. Snow pea pods are also eaten. However, they're traditionally picked before the pea inside the pod swells. These are the yummy flat peas most often associated with stir fry. Of course, it would be too simple to have only two types of peas, right? Peas benefit from an overnight soaking in water to speed germination. I've planted both straight and pre-sprouted seeds, and I've always enjoyed an earlier harvest from the pre-sprouted vines. Sow seeds early, as soon as you can work the soil in the spring. (I also plant a second crop in the fall, and in our zone with a bit of frost covering—we harvested peas through December.) Space seeds 2-3” apart and plant at approximately ½-inch depth. Peas thrive in well-drained, moist soil with good sun, approximately 6-8 hours. Honestly, though—our peas planted in the potager grow well with less than the recommended amount of sun. When planning crop rotation, peas often do well following potatoes, and brassica crops do well following peas, as they absorb the nitrogen that peas nodules provide if the roots remain in the ground. Pea varieties range from two to 10 feet in height, with the tall varieties requiring trellises. I plant my peas in the same beds that held last season's tomatoes, taking advantage of the staking/trellising system that I used for the tomatoes. Rows of peas are planted on each side of the trellis. In our potager, peas trellis along the garden fence, which is not only practical—it's also pretty. 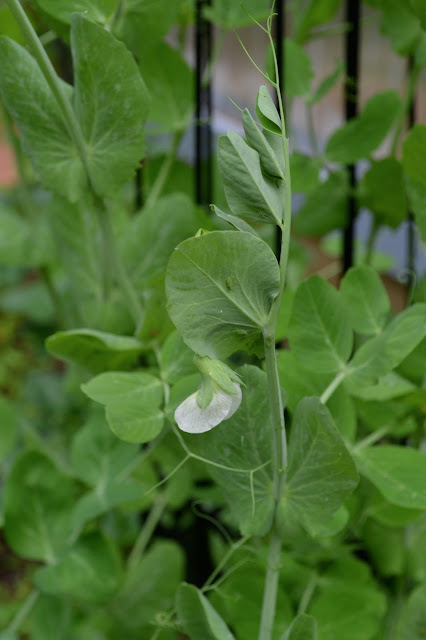 Pea blossoms are a gorgeous addition to the edible garden. Have limited space or no yard? Peas are an ideal crop for you. Because they grow vertically, you'll have room for other cool weather crops, like lettuce or Swiss chard. A large container and a tomato cage provide an easy method for balcony gardeners to enjoy peas, and the dwarf 'Tom Thumb' variety can easily reside in a window box. There's really no excuse not to eat your peas. Keep pea vines well-harvested. The more you pick, the more peas the vine will produce. If you plan to eat the pods of 'Golden Sweet' or similar varieties, harvest the pods young. If you prefer shelling peas, make certain the pod is mature—you can see the swell of the peas within the pod. Be careful when harvesting peas, though. Gently remove the pods with two hands. Trust me. I've been known to break vines in my haste to harvest peas. Remove the strings from the snap peas. Trim and peel the vegetables. Slice the vegetables so that they are all about the same size—about ¼ inch thick. The asparagus, snap peas, and carrots can be sliced on the diagonal. Parboil the carrots for 1 minute in salted water. Deglaze the pan with the vegetable stock or water and add the remaining butter and a squeeze of lemon juice. Let the sauce reduce by one third and pour it over the vegetables. Serves 4. Is it spring yet? I'm so ready for delicious peas and asparagus. Now, out you go, into the garden with pea seeds in hand! Just think—in a few months, you will thank me for forcing you out into the cold to plant your peas. And we'll both thank Alice Waters as we feast on her delicious recipe. Join Garden Writers on the 4^th^ day of each month to find out how You Can Grow That!